Bi-folding doors are great in winter too! Bi-folding doors will add a whole new level to your energy efficiency, which will ensure that you require less heat to keep your house warm and cosy during the winter months. High efficiency glazing has a special technology that reflects heat back into the room, rather than allowing it to escape into the outside world. This will enable any warmth to stay inside your home and keep your internal temperatures at a comfortable level, without having to keep the heating on every day. The glazing works so well, that we encourage you to keep any blinds open during the winter. This allows the glass panes to absorb the heat of the sun’s rays, adding even more heat to your living spaces. The larger the amount of glazing, the more opportunity for the sun to warm up the space, this is often why conservatories are much warmer in the cooler months than you may expect. Something else to consider is that these doors can still be used to help give the illusion of space. Because it isn’t a wall, you can maximize internal space. This will suit those of you that have get-togethers, as your guests will feel they have plenty of space to enjoy winter and festive parties. The place won’t seem overcrowded, giving you the opportunity to use each space to its full potential, whilst everyone keeps nice and warm. 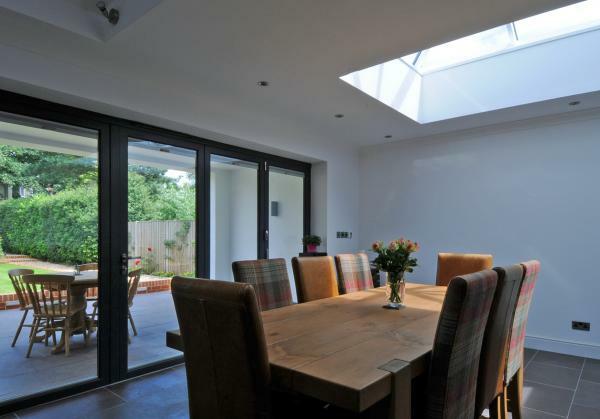 Finally, bi-folding doors offer an exceptional amount of natural light. The crisp winter sun will highlight your home with reflections and sunlight, making your bi-folds the ultimate winter centrepiece. If you want to control the light, invest in curtains or blinds to create your ideal setting.